In a 44 to 30 vote, the Rhode Island House of Representatives on Thursday moved the state one step closer to guaranteeing a woman’s right to an abortion. 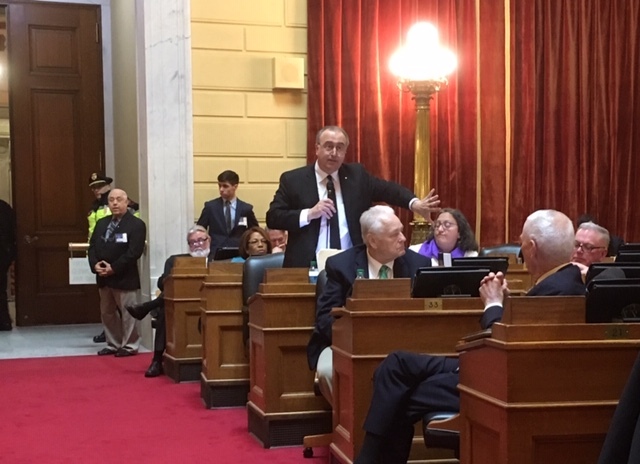 The vote elicited cheers from abortion-rights supporters in the House gallery, and it was the first significant vote on abortion in Rhode Island since 1993. House Speaker Nicholas Mattiello pointed to lawmakers’ support for the measure, and polling showing support, in explaining why he supported bringing the bill to the floor even though he personally opposed it. The vote followed almost five hours of civil discussion among somber lawmakers, as opponents waged an unsuccessful effort to pass five amendments. Rep. Robert Phillips (D-Woonsocket) was among the lawmakers voting against the measure. “I rise in opposition to this bill, first and foremost because it’s morally reprehensible to me to take someone’s life, whether it be an adult, a child that’s growing up or an unborn child,” Phillips said. Supporters countered by saying that women don’t come lightly to a decision involving an abortion. Despite the anguish involved in such a choice, they said, women must have control over their own bodies. The effort to create a state-based right to an abortion intensified after the election of President Donald Trump in 2016. But until a poll last fall showed that more than 70 percent of Rhode Islanders support abortion rights, Speaker Mattiello was resistant to the idea of bringing an abortion bill to the House floor. It was too divisive, he said, and he expressed skepticism that the U.S. Supreme Court would overturn Roe vs. Wade. The Rhode Island Catholic Conference expressed "grave disappointment" in the vote. The bill introduced by Rep. Anastasia Williams (D-Providence) could face a tight vote in the state Senate, where a companion version remains in committee. Senate spokesman Greg Pare said a committee vote has not yet been scheduled. Rep. Arthur Corvese (D-North Providence), an opponent of abortion, speaks during the debate.